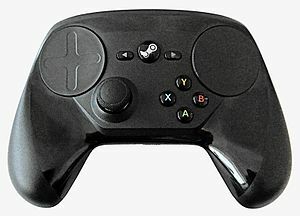 The Steam Controller is a game controller developed by Valve Corporation to be used with personal computers running Steam on Microsoft Windows, macOS, Linux or SteamOS. The controller is designed not only for games developed for controller users, but also for games traditionally played with keyboard and mouse controls so that they can be played through the controller. The Steam Controller features two high-resolution clickable trackpads (replacing the typical thumbsticks on modern console controllers), and fourteen buttons, including face, shoulder, and undergrip buttons. The trackpads include haptic feedback, which can send tactile feedback to the player in reaction to events within the game; Chris Kohler of Wired described using the controller while playing Civilization V at a press event at Valve, and noted that as he used the trackpad to move the mouse cursor, electromagnets within the controller created audio and tactile feedback as if he were using a trackball. Although the controller is designed for the Steam Machine platform, it can also be used with Steam on existing PCs. The controller also included gyroscopic sensors to detect the relative orientation of the controller. A representative configuration page for the Steam Controller, which demonstrates the array of settings that can be adjusted on a per-game basis. The controller is presently designed to be used within Steam's Big Picture mode; this enables the player to access detailed options for setting up the various features of the controller on a per-game basis including button/trackpad mapping and sensitivity as well as accessing other users' shared controller configuration to use themselves. The Steamworks API provides means for developers to provide more detailed settings for the Steam Controller when in Big Picture mode. Outside of Big Picture mode, the controller otherwise behaves as a standard two-stick controller, though Valve does plan on updating Steam to allow retaining the previously set Big Picture mode per-game settings. The original design of the controller was to include a touchscreen in the center of the unit. The touchscreen would have acted like a mousepad and allow players to perform actions that typically are not capable on controllers, operating directly with Steam or SteamOS and overlays touchscreen display onto the players' screens to allow manipulation of the game without diverting attention from the screen. However, at the January 2014 Steam Dev Days event, Valve revealed they have since dropped the touchscreen concept from the controller, rearranged existing face buttons to be more compatible with existing games. Valve went through several iterations for a controller that would be able to mimic keyboard and mouse controls, using prototypes made with 3D printing to test ergonomics. Early versions of the controller design included a trackball embedded in the controller to simulate mouse functionality, but opted eventually for trackpads to give more customization functionality to developers including the ability to simulate the motion of trackball by tracking a finger's motion on the trackpad. The trackpads and controller design were made to minimize the amount of contact that a player's thumbs would have on the trackpad when holding the unit. Unlike their current plans to have third-party hardware vendors manufacture Steam Machines, Valve plans to remain the sole manufacturer of the Steam Controller. Valve's Greg Coomer stated that this decision was based on achieving the best implementation of the Controller and Valve's vision for the device, noting that "we didn’t think that it was really going to be possible to outsource the design for manufacturing and the finishing of the controller in a way that would allow third parties to take from us an idea or a reference design and bring it to market soon enough". Valve did clarify that they will open up specifications for third-party controllers to be developed. As of December 2015[update], Valve is working with Flextronics robotic assembly line in Buffalo Grove, Illinois to assemble the machines; jokingly, the machines have been given Aperture Science branding, the fictional company from Valve's Portal series. Valve has pushed out updates that enable more customization and functionality to the Steam Controller. Valve has added improvements to the controller's capabilities based on public feedback following its launch, which include movement and aiming controls schemes using its internal gyroscope, the ability to trigger actions that enable cursor movement limited to certain regions on a UI (such as to manipulate a game's mini-map), a quick-access popup for 16 commands that can act similar to hotkeys for keyboard-and-mouse games, cloud-based controller configuration saving, and support for non-Steam games that otherwise can be played through the Steam Overlay. Several updates were introduced in June 2016. One update enabled users to create actions using the Controller to switch between two or more different configuration on the fly. This update also enabled the ability to customize the motion-sensing controls to be used for virtual reality games. A second update in June 2016 enabled buttons to be "Activators" which can respond differently based on the type of input on the button, distinguishing between a single short tap, an extended hold, and a double-tap, for example. Activators can also be used to simulate the constant holding of a button with a single press, such as often used for the action of crouching in many first-person or third-person shooters. Valve is planning on supporting similar controller customization features and user interfaces to other compatible controllers, and released the first such update in the Steam software for Sony's DualShock 4 controller in December 2016, and beta support for other controllers including Xbox One in January 2017. Support for the Nintendo Switch Pro Controller was added in May 2018. While other controllers can be used on Steam through basic operating system functionality, Steam's support will allow players to customize supported controllers through a similar interface offered for the Steam Controller. Further, developers do not have to be aware of the specific controller as the same Steam controller interface handles the translation to the specific hardware used by the player. On March 23, 2016, Valve announced it would be publicly releasing computer aided design geometry for the Steam controller. The CAD geometry will be released under a Creative Commons license. In May 2018, Valve updated the controller to enable its Bluetooth communications, allowing it to pair with mobile devices. This allows the controller to be used alongside the Steam Link app which replaced Steam Link hardware. The Steam Controller was publicly released in November 2015, alongside the release of Steam Machines. By June 2016, over 500,000 had been sold and by October, nearly one million had sold, including the controllers bundled with the Steam Machines. In October 2016, Valve disclosed 27,000 controllers were in "daily active use". ^ Kohler, Chris (November 4, 2013). "Full Steam Ahead: Inside Valve's Grand Plan to Replace Game Consoles With PCs". Wired. Retrieved November 4, 2013. ^ Webster, Andrew (September 27, 2013). "Valve unveils the Steam Controller". The Verge. Retrieved September 27, 2013. ^ Felnon, Wes (November 10, 2015). "Steam Controller review in progress". PC Gamer. Retrieved November 10, 2015. ^ Sheridan, Connor (January 15, 2014). "Steam Controller loses touchpad plans, gets classic face buttons". Computer and Video Games. Retrieved January 15, 2014. ^ Kohler, Chris (November 4, 2013). "Steam Controllers Will Only Be Made By ValveSee the Dramatic Evolution of Valve's Steam Controller". Wired. Retrieved November 4, 2013. ^ Goldfarb, Andrew (November 4, 2013). "Steam Controllers Will Only Be Made By Valve". IGN. Retrieved November 4, 2013. ^ Grubb, Jeffrey (January 15, 2014). "Steam Dev Days: Greenlight gets death sentence, third-party Steam controllers, and 75 million users". Venture Beat. Retrieved January 15, 2014. ^ "Building the Steam Controller". Valve Corporation. December 10, 2015. Retrieved December 10, 2015. ^ Kamen, Matt (December 11, 2015). "Watch robots build Valve's Steam Controller". Wired UK. Retrieved December 11, 2015. ^ Prescott, Shaun (December 11, 2015). "Valve outlines forthcoming Steam Controller improvements". PC Gamer. Retrieved December 11, 2015. ^ Hillier, Brenna (December 11, 2015). "Watch robots build the Steam Controller". VG247. Retrieved December 11, 2015. ^ Crecente, Brian (June 2, 2016). "Steam Controller adds motion VR support as sales top half a million". Polygon. Retrieved June 17, 2016. ^ Morrison, Angus (June 17, 2016). "Customise every button press with the Steam Controller's 'Activators' update". PC Gamer. Retrieved June 17, 2016. ^ Tarason, Domonic (May 2, 2018). "Steam Input adds native Switch Pro Controller support". Rock Paper Shotgun. Retrieved May 2, 2018. ^ Graft, Kris (October 12, 2016). "Steam to expand PlayStation 4 gamepad support in new update". Gamasutra. Retrieved October 12, 2016. ^ McCoon, Alissa (December 14, 2016). "Steam updates PS4 controller support with new configuration options". Gamasutra. Retrieved December 14, 2016. ^ Williams, Mike (January 6, 2017). "Steam Beta Adds Native Support for Xbox One, Xbox 360 and Generic Controllers". US Gamer. Retrieved January 6, 2017. ^ Porter, Matt (March 23, 2016). "Valve releases Steam Controller CAD geometry so you can mod it". PCGamer. Retrieved March 23, 2016. ^ Loup, Pierre (March 23, 2016). "Steam Controller CAD Release". Valve. Retrieved May 26, 2016. ^ Bourdeau, Ian (May 13, 2018). "Valve have activated Bluetooth on the Steam Controller. Here's how to turn it on". PCGamesN. Retrieved May 13, 2018. ^ Robinson, Martin (March 3, 2015). "Valve announces the Source 2 engine, which will be free to developers". Eurogamer. Retrieved March 3, 2015. ^ Devore, Jordan (June 1, 2016). "Valve has sold over 500K Steam Controllers". Destructoid. Retrieved June 1, 2016. ^ Saed, Sherif (October 13, 2016). "The Steam Controller has sold nearly 1 million units". VG247. Retrieved October 13, 2016. This page was last edited on 6 March 2019, at 10:38 (UTC).